This plant belonging to family Cucurbitaceae grows wild all over the country. · This plant belonging to family Cucurbitaceae grows wild all over the country. 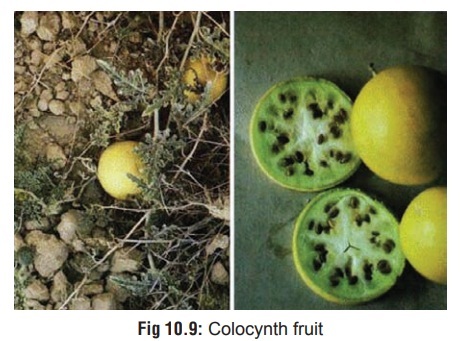 · Fruits are globular, 3 to 4 inches in diameter, variegated green and white, with a dry, spongy, bitter pulp (Fig 10.9). · Seeds are 4 to 6 mm long and pale brown in colour. · The root is bitter and pungent, and is used as a folk remedy for various ailments. 1. Dried fruit pulp is used as a purgative by rural folk. 2. Root is used by quacks for the treatment of jaundice, rheu-matism, constipation, etc. Decontamination: Stomach wash, activated charcoal.